An example of a magnesium machine furnace designed as a double-chamber crucible furnice is shown Fig. 2 (Ing. Rauch Fertigungstechnik GmbH). Due to the increased melting rate, long-life bayonet heaters which can be serviced without taking the crucible out are used in these furnaces. Furthermore, the heating elements have two separate zones. 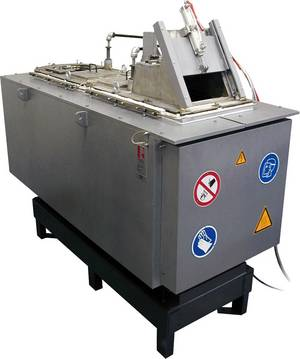 This means that the temperature in the melting chamber and goose-neck chamber can be regulated separately. The double-chamber construction also means that, during loading, no swirling takes place in the goose-neck chamber. The melt surface is covered in two separate atmospheres with shielding gas which can be set separately. The goose neck is adapted into the crucible cover plate with a ceramic sealing cord which makes dosing possible free from impurities. 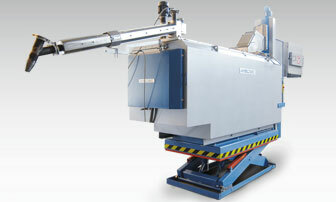 The machine furnace is either loaded manually or fully automatically using a magnesium pig heat-up device.